This 6"x2" flanged wheel is designed to operate on "railroad" type tracks to minimize rolling effort and aid in guidance. These wheels offer superior wear resistance to V-Groove wheels and are made of a high-performance malleable iron alloys that are resistant to breakage, chipping and cracking. Common uses: Heat treated operations, marine railroads, traveling cranes, bogey, skips and other transportation operations. 6" x 2" Ductile Steel Swivel Caster-total lock brake-1250 lbs Cap. 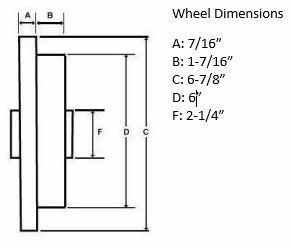 Click the button below to add the 6" x 2" Flanged Ductile Steel Wheel with Roller Bearing - 2000 lbs Capacity to your wish list.